One morning, on my way to work, I coasted past a boba place and, as evil little thoughts of stopping in flooded my brain, I made a deal with myself: If there was a parking spot waiting me, I’d park and go into the shop. Well, there was a very nice spot right in front of the entrance. When I saw the word rose on the wall, I had to try it. Now, I’m hooked on Rose Milk Tea and want to stop by the boba shop every morning on my way into the office. But, this little habit can be very expensive. So, I started making it at home. Adding milk to tea is a blurry memory from my childhood, something I really did not enjoy. With tea shops popping up everywhere, I have come to appreciate it, especially spiked with almond or rose flavor, capped with crushed iced. Add squishy boba and I’ll be your friend forever. Rose syrup is available at your local Middle Eastern grocery store or online at PersianBasket.com. Cortas is my favorite brand for rose and orange blossom water.You can also make the syrup with rose water. If you have roses in your garden, you can make the rose syrup yourself. It’s easy. Just make sure the roses have not been sprayed with pesticides. These little visits to the boba shop can get pricey. Make the stuff at home and you’ll see it’s fabulous! Bring water and sugar to a boil in a saucepan. Lower the flame and simmer 20 mins. Store in a clean, dry glass bottle in the fridge for 1 week. Gently remove the petals and collect them in the bowl. Carefully move the petals in the water a few times, then set onto paper towels to soak up the excess water. Set a large pot over medium-high heat. Bring rose petals, sugar and water to a boil, stirring gently. Remove from heat and let the mixture rest for 1 hour, steeping like tea. Add food coloring, if using. Mix well. Combine ingredients in a two 16 oz. glasses filled with ice. Stir gently. Add tapioca balls (boba) if desired. It’s now 2:30 in the morning, when I’m usually fast asleep, but not tonight. I’m wide awake, thanks to scruffy Mr. Ozzie who kept whining and crying until I gave up and let him out into the backyard. Milou went barreling after him and the two of them got into a kerfuffle with a skunk. Unfortunately, they came storming back into the house and spread the stink all over our downstairs. I had to race to the shut doors to keep them out of as many rooms as possible, then spent hours de-skunking them, our rugs, towels, my night gown and anything else that was contaminated. I’ve taken a shower and the dust has finally settled. Funny, Daisy slept peacfully through the whole thing. 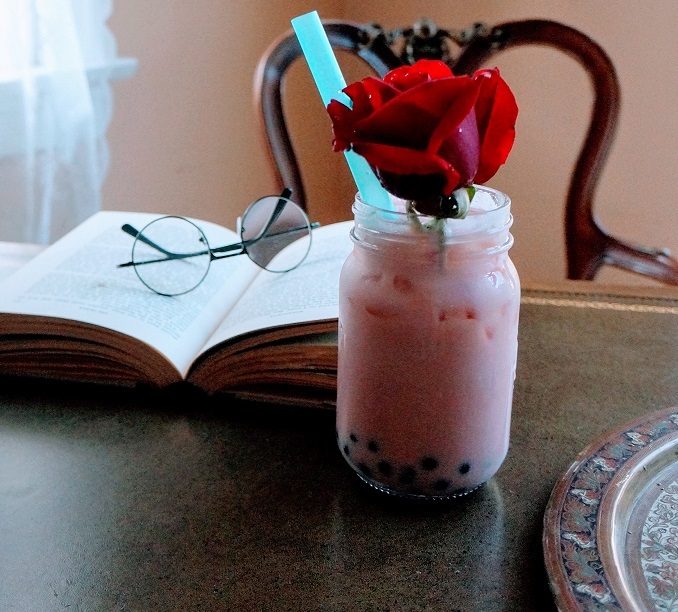 I, on the other hand, am a tad traumatized, but have earned a tall glass of rose milk tea, don’t you think? Oh, you poor thing! Our dog got skunked once and I will never forget his burning, weepy eyes as we cleaned him (with tomatoe juice!). Yes’m, you deserve that tea! While I don’t drink tea (and never have), I can think of many uses for the rose syrup! Lovely!